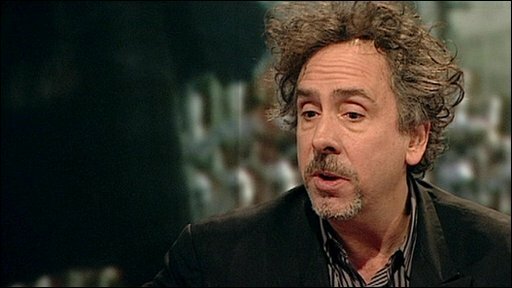 Odeon has reversed its decision to boycott Tim Burton's new 3D film version of Alice in Wonderland following talks with Disney. The cinema chain had vowed not to show the film in the UK, Irish Republic and Italy over Disney's plans to release the film on DVD at the end of May. Actor Michael Sheen, who plays the White Rabbit, said the row had been "a storm in a mad hatter's tea cup". "I'm glad they've resolved it," he told the BBC. Earlier, Burton had called Odeon's decision not to screen the film as "upsetting". "I feel terrible about it," the director told the BBC's Breakfast programme. "To me it doesn't make anybody look good." Burton added that he hoped "something is going to be worked out", but had not been involved in talks, which are understood to have lasted late into Wednesday night. His partner, Helena Bonham Carter, who stars as the Red Queen in the film, was more forthright. "It was embarrassing and awful," she said, adding that her children had been without their father "for the last nine months" because of the demands of making a 3D film. "Then just to be told, 'we're not going to show it in 3D', it felt like being in Wonderland. It was nonsense. It didn't make any sense." "It was not a happy household for the last few weeks, I can tell you that." Odeon made its original decision in response to Disney's plan to reduce the period between a film's debut and its DVD release from the standard 17 weeks. The cinema chain said the plan would "set a new benchmark, leading to a 12-week window becoming rapidly standard". In a statement following talks with Disney, Odeon said: "The Odeon and UCI Cinema Group is pleased to announce that, following detailed negotiations with the Walt Disney Company Ltd, an enduring agreement has been reached encompassing all the different aspects of both companies' commercial relationship. "As a result of this agreement, Odeon is pleased to confirm that it will be able to continue with its plans for significant investment in new cinemas, in digital technology, in 3D capability and the other exciting developments designed for the increased enjoyment of all its customers." Neither side would disclose terms of the agreement, but the Cineworld and Vue cinema chains, which will also be screening the film, had previously agreed to a 13-week gap between opening night and the DVD release. Mia Wasikowska, who plays Alice in the film, said the cast had been "aware" of the dispute, but "let the studio handle it". "I'm glad that it's over," she added. Burton, Bonham Carter, and Johnny Depp, who stars as the Mad Hatter, all attended the premiere on Thursday at London's Odeon Leicester Square.